A hat and safety shoes must be worn. Prepare a grille cover, fender cover, seat cover and floor mat before starting work. When working with 2 or more persons, be sure to check the safety of one another. When working with the engine running, make sure to provide ventilation for exhaust fumes in the workshop. If working on high temperature, high pressure, rotating, moving, or vibrating parts, wear appropriate safety equipment and take extra care not to injure yourself or others. 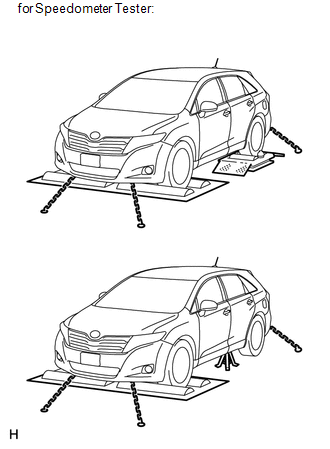 When jacking up the vehicle, be sure to support the specified locations with safety stands. When lifting up the vehicle, use appropriate safety equipment. Before starting work, prepare a tool stand, SST, measuring equipment, oil, and any replacement parts required. Diagnose with a thorough understanding of proper procedures and of the reported problem. Before removing any parts, check the general condition of the assembly and for deformation and damage. If the procedure is complicated, take notes. For example, note the total number of electrical connections, bolts, or hoses removed. Add matchmarks to ensure reassembly of components in the original positions. Temporarily mark hoses and their fittings if needed. Clean and wash the removed parts if necessary and assemble them after a thorough check. Place the removed parts in a separate box to avoid mixing them up with new parts or contaminating the new parts. For non-reusable parts such as gaskets, O-rings and self-locking nuts, replace them with new ones as instructed in this manual. Retain the removed parts for customer inspection, if requested. Make sure that removed and installed parts (oil filler cap, level dipstick, floor mat, etc.) are properly installed/tightened. Make sure that none of the cloths or tools that were used have been left in the engine compartment or within the vehicle. Check that there are no oil leaks. *: Be sure to perform these checks properly, Not performing these checks properly after finishing work can lead to serious accident or injury. (1) Care must be taken when jacking up and supporting the vehicle. Be sure to lift and support the vehicle at the proper locations. 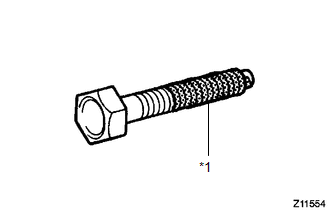 (1) Precoated parts are bolts and nuts that are coated with seal lock adhesive at the factory. (2) If a precoated part is retightened, loosened or moved in any way, it must be recoated with the specified adhesive. (3) When reusing a precoated part, clean off the old adhesive and dry the part with compressed air. Then apply new seal lock adhesive appropriately to that part. (4) Some seal lock agents harden slowly. You may have to wait for the seal lock adhesive to harden. (1) When necessary, use a sealer on gaskets to prevent leaks. (1) Carefully follow all the specifications for tightening torque. Always use a torque wrench. 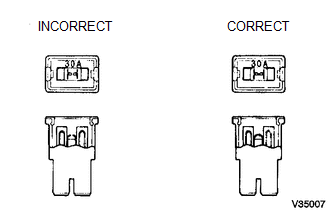 (1) When inspecting a fuse, check that a wire of the fuse is not broken. 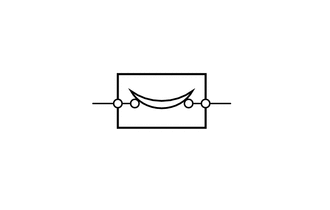 (2) If the wire of a fuse is broken, confirm that there are no shorts in its circuit. 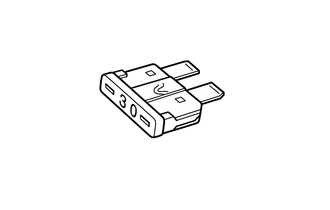 (3) When a fuse is replaced, a fuse with the same amperage rating must be used. 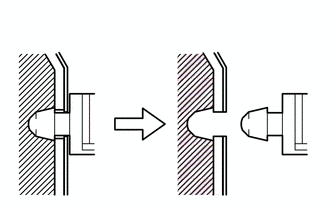 (1) The removal and installation methods of typical clips used for vehicle body parts are shown in the table below. If clips are damaged during a procedure, always replace the damaged clips with new ones. Remove the clips with a clip remover or pliers. Remove the clips with a clip remover or screwdriver. Remove the clips with a wide scraper to prevent panel damage. Remove the clips by pushing the center pin through and pulling out the shell. Remove the clips by unscrewing the center pin and prying out the shell. Remove the clips by prying out the pin and then prying out the shell. 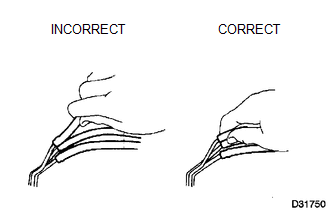 (1) The removal and installation methods of typical claws used for vehicle body parts are shown in the table below. If claws are damaged during a procedure, always replace the cap or cover that has damaged claws with a new one. 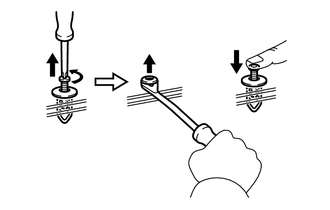 Using a screwdriver, disengage the claws and remove the cap or cover. 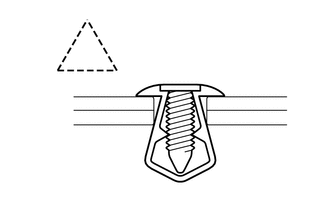 Using a screwdriver, detach the claws and remove the cap or cover. (i) HINGES, GUIDES, CLAMPS, PINS, ETC. 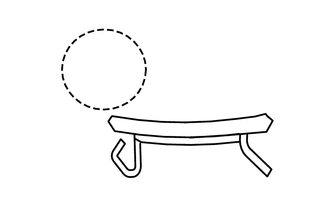 (1) The removal and installation methods of typical hinges, guides, clamps and pins used for vehicle body parts are shown in the table below. If clamps are damaged during a procedure, always replace the cap or cover that has damaged clamps with a new one. Pull away from the pins to disengage. Disengage the pins by pulling. Remove the clamps with pliers. 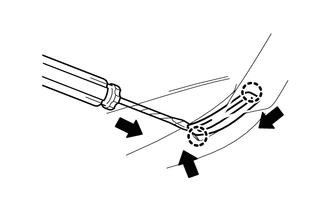 (1) To disconnect a vacuum hose, pull and twist it from the end of the hose. Do not pull it from the middle of the hose as this may damage the hose. (2) When disconnecting vacuum hoses, use tags to identify where they should be reconnected. (3) After completing any hose related repairs, double-check that the vacuum hoses are properly connected. The label under the hood shows the proper layout. (4) When using a vacuum gauge, never force the hose onto a connector that is too large. If a hose has been stretched, air may leak. Use a step-down adapter if necessary. (1) Use the formula below to calculate special torque values for situations where SST or an extension tool is combined with a torque wrench. If an extension tool or SST is combined with a torque wrench and used to tighten to a torque specification in this manual, the actual torque will be excessive and parts will be damaged. This vehicle is equipped with a Supplemental Restraint System (SRS). Before performing pre-disposal deployment of any SRS component, review and closely follow all applicable environmental and hazardous material regulations. Pre-disposal deployment may be considered hazardous material treatment. Failure to carry out the service operations in the correct sequence could cause the SRS to unexpectedly deploy during servicing and lead to serious injury. Furthermore, if a mistake is made when servicing the SRS, it is possible that the SRS may fail to operate properly. Before servicing (including removal or installation of parts, inspection or replacement), be sure to read the following section carefully. (1) As malfunctions of the SRS are difficult to confirm, the Diagnostic Trouble Codes (DTCs) become the most important source of information when troubleshooting. When troubleshooting the SRS, always check for DTCs before disconnecting the battery. (2) Work must be started at least 90 seconds after the ignition switch is turned off and after the cable is disconnected from the negative (-) battery terminal. The SRS is equipped with a back-up power source. If work is started within 90 seconds after turning the ignition switch off and disconnecting the cable from the negative (-) battery terminal, the SRS may deploy. 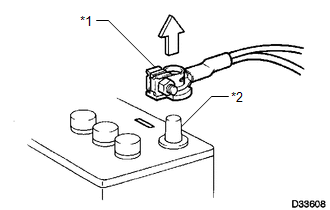 When the cable is disconnected from the negative (-) battery terminal, the clock and audio system memory will be erased. Before starting work, make a note of the settings of each memory system. When work is finished, reset the clock and audio system as before. Never use a back-up power source (battery or other) to avoid erasing the system memory. The back-up power source may inadvertently power the SRS and cause it to deploy. (3) If the vehicle has been involved in a minor collision where the SRS does not deploy, the steering pad, front passenger airbag assembly, knee airbag assembly, front seat side airbag assembly, curtain shield airbag assembly and front seat outer belt assembly should be inspected before further use of the vehicle. (4) Never use SRS parts from another vehicle. When replacing parts, use new parts. (5) Before repairs, remove the airbag sensor assemblies if impacts are likely to be applied to the sensor during repairs. 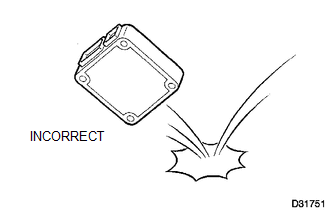 (6) Never disassemble and attempt to repair any airbag sensor assemblies or airbag assemblies. 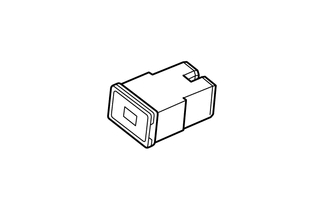 (7) Replace the airbag sensor assemblies and the airbag assemblies if: 1) damage has occurred from being dropped, or 2) cracks, dents or other defects in the case, bracket or connector are present. (8) Do not directly expose the airbag sensor assemblies or airbag assemblies to hot air or flames. 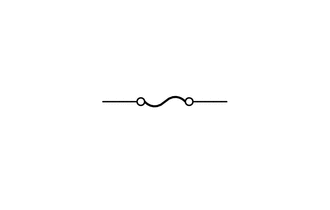 (9) Use a voltmeter/ohmmeter with high impedance (minimum = 10 kΩ) for troubleshooting electrical circuits. (10) Information labels are attached to the SRS components. Follow the instructions on the labels. (11) After work on the SRS is completed, check the SRS warning light. 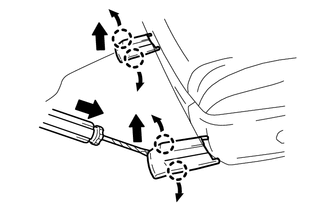 (1) The steering wheel must be fitted correctly to the steering column with the spiral cable at the neutral position. Otherwise, cable damage and other problems may occur. 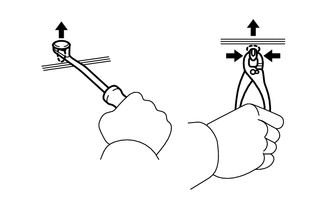 Refer to the information about correct installation of the steering wheel (See page ). (1) Always place a removed or new steering pad with the surface facing upward. 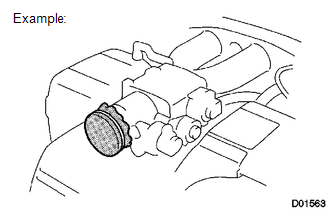 Placing the steering pad with the pad surface facing downward could cause a serious accident if the airbag deploys. Also, do not place anything on top of the steering pad. (2) Never measure the resistance of the airbag squib. This may cause the airbag to deploy, which could cause serious injury. (3) Grease or detergents of any kind should not be applied to the steering pad. (4) Store the steering pad in an area where the ambient temperature is below 93°C (200°F), the humidity is not high and there is no electrical noise. (5) Before using an electric welder anywhere on the vehicle, disconnect the center airbag sensor assembly connectors. These connectors contain shorting springs. This feature reduces the possibility of the airbag deploying due to current entering the squib wiring. (6) When disposing of the vehicle or the steering pad by itself, the airbag should be deployed using SST before disposal (See page ). Deploy the airbag in a safe place away from electrical noise. 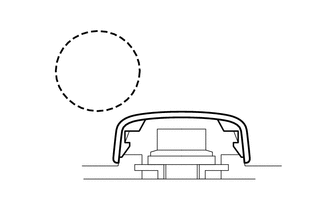 (1) Always place a removed or new front passenger airbag assembly with the pad surface facing upward. Placing the airbag assembly with the airbag deployment direction facing downward could cause a serious accident if the airbag deploys. (3) Grease or detergents of any kind should not be applied to the front passenger airbag assembly. (4) Store the airbag assembly in an area where the ambient temperature is below 93°C (200°F), the humidity is not high and there is no electrical noise. 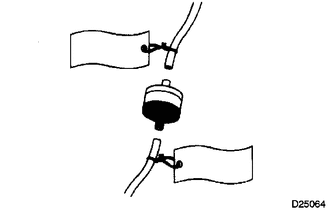 (1) Always place a removed or new knee airbag assembly with the airbag deployment direction facing upward. 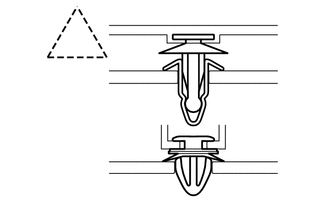 Placing the airbag assembly with the airbag deployment direction facing downward could cause a serious accident if the airbag deploys. (3) Grease or detergents of any kind should not be applied to the knee airbag assembly. (4) Store the knee airbag assembly in an area where the ambient temperature is below 93°C (200°F), the humidity is not high and there is no electrical noise. (6) When disposing of a vehicle or knee airbag assembly unit by itself, the airbag should be deployed using SST before disposal (See page ). Deploy in a safe place away from electrical noise. 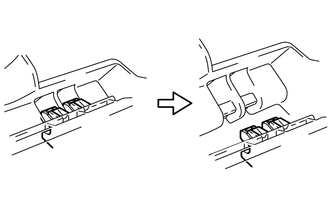 (1) Always place a removed or new front seat side airbag assembly with the airbag deployment direction facing upward. (3) Grease or detergents of any kind should not be applied to the front seat side airbag assembly. (1) Always place a removed or new curtain shield airbag assembly in a clear plastic bag, and keep it in a safe place. The plastic bag should be disposed of after use. Never disassemble the curtain shield airbag assembly. 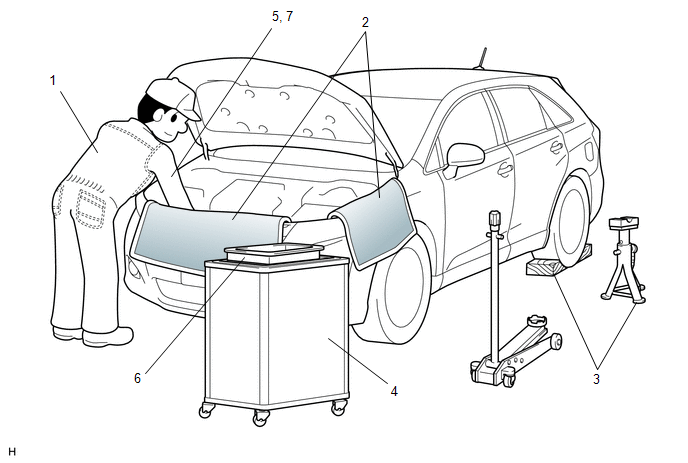 (3) Grease or detergents of any kind should not be applied to the curtain shield airbag assembly. (1) Never measure the resistance of the front seat outer belt assembly. This may cause the pretensioner of the front seat outer belt assembly to activate, which could cause serious injury. 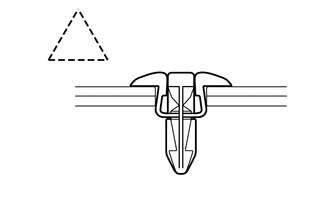 (2) Never disassemble the front seat outer belt assembly. (3) Never install the front seat outer belt assembly on another vehicle. (4) Store the front seat outer belt assembly in an area where the ambient temperature is below 80°C (176°F), the humidity is not high and there is no electrical noise. in a safe place away from electrical noise. (7) As the front seat outer belt assembly is hot after being activated, allow some time for it to cool down sufficiently before disposal. Never apply water to cool down the front seat outer belt assembly. (8) Grease, detergents, oil or water should not be applied to the front seat outer belt assembly. (1) Never reuse a center airbag sensor assembly that has been involved in a collision where the SRS has deployed. (2) The connectors to the center airbag sensor assembly should be connected or disconnected with the sensor installed to the vehicle. 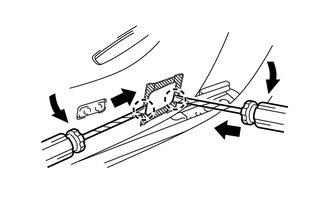 If the connectors are connected or disconnected while the center airbag sensor assembly is not installed, the SRS may activate. (3) Work must be started at least 90 seconds after the ignition switch is turned off and the cable is disconnected from the negative (-) battery terminal, even if only loosening the bolts of the center airbag sensor assembly. (1) All the connectors in the system are a standard yellow color. If an SRS wire harness has an open circuit or a connector is broken, replace it. After the ignition switch is turned off, the radio and display receiver assembly records various types of memory and settings. As a result, after turning the ignition switch off, make sure to wait at least 60 seconds before disconnecting the cable from the negative (-) battery terminal. After the ignition switch is turned off, the navigation receiver assembly records various types of memory and settings. As a result, after turning the ignition switch off, make sure to wait at least 60 seconds before disconnecting the cable from the negative (-) battery terminal. 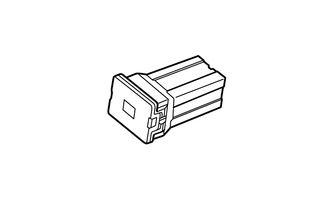 (1) Before performing work on electronic components, disconnect the cable from the negative (-) battery terminal to prevent damage to the electrical system or components. (2) When disconnecting the cable, turn the ignition switch and headlight switch off and loosen the cable nut completely. Perform these operations without twisting or prying the cable. Then disconnect the cable. 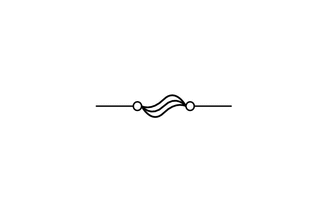 (3) Clock settings, radio settings, audio system memory, DTCs and other data will be cleared when the cable is disconnected from the negative (-) battery terminal. Write down any necessary data before disconnecting the cable. (1) Do not open the cover or case of the ECU unless absolutely necessary. 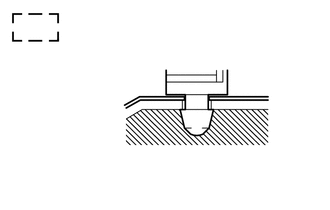 If the IC terminals are touched, the IC may be rendered inoperative by static electricity. 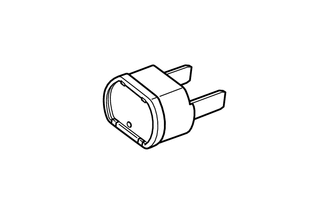 (2) Do not pull on the wires when disconnecting electronic connectors. Pull on the connector itself. (3) Do not drop electronic components, such as sensors or relays. If they are dropped on a hard surface, they should be replaced. (4) When cleaning the engine with steam, protect the electronic components, air filter and emission-related components from water. (5) Never use an impact wrench to remove or install temperature switches or temperature sensors. 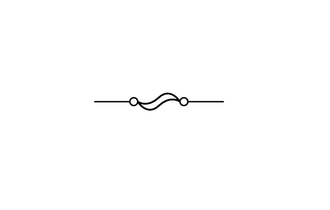 (6) When measuring the resistance between terminals of a wire connector, insert the tester probe carefully to prevent the terminals from bending. When the ignition switch is turned off and the engine temperature is high, the cooling fans may operate for a maximum of 6 minutes. After turning the ignition switch off, keep hands and objects away from the fans when they are operating. If all of the following are met for a certain period of time during a few minutes immediately before the engine is stopped, the electric fans will continue to operate for the maximum of 6 minutes after the engine is stopped. This is performed to ensure restartability and stabilize idle speed. The Techstream indicates a very high coolant temperature. The Techstream indicates a high outside air temperature. The vehicle has been driven under high load (driving on an uphill or equivalent). (1) Work in a location with good air ventilation that does not have welders, grinders, drills, electric motors, stoves, or any other ignition sources nearby. (2) Never work in a pit or near a pit as fuel vapors will collect there. 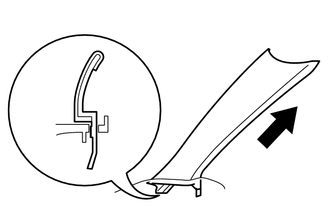 (1) Prepare a fire extinguisher before starting work. (2) To prevent static electricity, install a ground wire to the fuel changer and vehicle, and do not spray the surrounding area with water. Be careful when performing work in this area, as the floor surface will become slippery. Do not clean up gasoline spills with water, as this may cause the gasoline to spread, and possibly create a fire hazard. (3) Avoid using electric motors, work lights and other electric equipment that can cause sparks or high temperatures. (4) Avoid using iron hammers as they may create sparks. (5) Dispose of fuel-contaminated cloth separately using a fire resistant container. 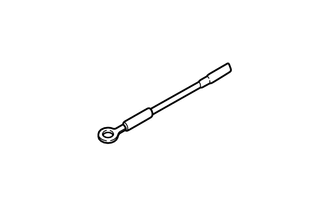 (a) If any metal particles enter intake system parts, this may damage the engine. (b) When removing and installing intake system parts, cover the openings of the removed parts and engine openings. Use adhesive tape or other suitable materials. (c) When installing intake system parts, check that no metal particles have entered the engine or installed parts. 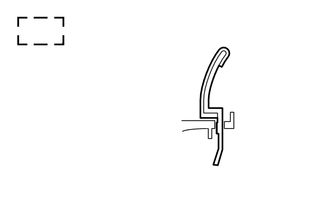 (a) Before removing a hose, check the clamp position so that it can be reinstalled in the same position. 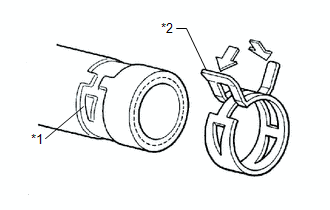 (b) Replace any deformed or dented clamps with new ones. 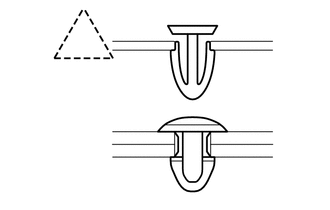 (c) When reusing a hose, attach the clamp on the clamp track portion of the hose. 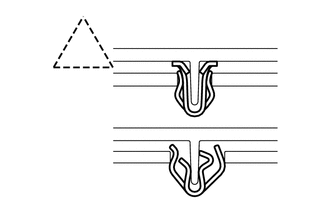 (d) For a spring type clamp, it may be necessary to spread the tabs slightly after installation by pushing them in the direction of the arrows as shown in the illustration. 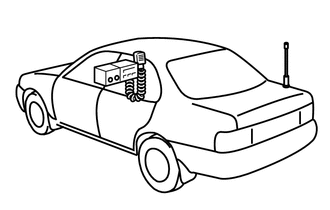 (a) Install an antenna as far away from the ECU and sensors of the vehicle electronic systems as possible. 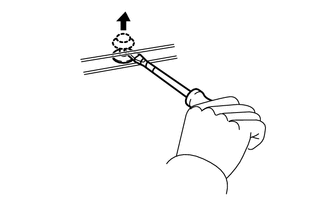 (b) Install an antenna and feeder at least 20 cm (7.87 in.) away from the ECU and sensors of the vehicle electronic systems. 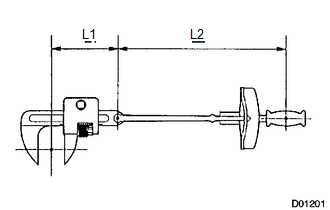 For details about ECU and sensor locations, refer to the section on the applicable components. (c) Keep the antenna and feeder separate from other wiring as much as possible. This will prevent signals sent from the communication equipment from affecting vehicle equipment and vice versa. (d) Check that the antenna and feeder are correctly adjusted. (e) Do not install a high-powered mobile communication system. (a) When the headlight dimmer switch assembly is set to HEAD, do not touch the discharge headlight's high-voltage socket area. When performing inspection or maintenance, the discharge headlight precautions must be followed. 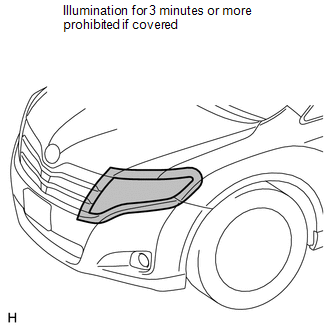 (b) When the headlights are illuminated, do not cover the headlights for 3 minutes or more. As the headlight's outer lens is made of resin, the resulting heat created when the headlight is covered for an extended period of time may deform the headlight. The vehicle may slip unexpectedly out of the dynamometer because of TRAC and VSC operations. Pressing the VSC OFF switch (for vehicles with a VSC OFF switch) does not disable TRAC and VSC operation completely. Make sure that the VSC warning light is blinking. Secure the vehicle with chains for safety. In the case of using speedometer tester, brake tester, or chassis dynamometer and so on, there is some possibility of a speed differential between the front and rear wheels. Therefore, please switch "AWD test mode" before doing tests or remove the fuse before doing tests and delete diagnostic code "C1298"after the tests. Inspection should be done using the front wheels. Do not brake or accelerate suddenly. Maximum vehicle speed must be less than 60 km/h (37 mph) (when using free rollers to support the rear wheels, vehicle speed must be less than 50 km/h (31 mph)). Driving time should be less than 1 minute. Follow all usage and safety procedures in the operator's manual for the speedometer tester. (1) Place the front wheels onto the rollers. (2) Enter inspection mode to disable TR(A)C and VSC control. (3) Place the rear wheels on free rollers or use safety stands to allow the rear wheels to rotate freely. (4) Secure the vehicle with suitable chains or straps. (5) Start the engine, and then measure the vehicle speed while increasing the speed gradually with the shift lever in D.
(6) After the test is finished, decrease the speed gradually, and then stop the vehicle. A high-speed type brake tester cannot be used. Vehicle speed should be less than 0.5 km/h (0.3 mph). Follow all usage and safety procedures in the operator's manual for the brake tester. 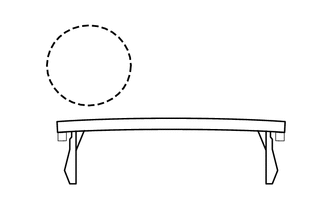 (1) Place the wheels to be tested (front or rear) onto the rollers. 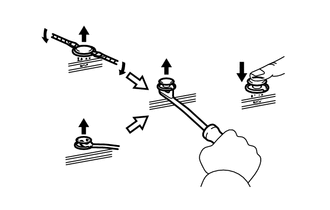 (2) Move the shift lever to N.
(3) Start the engine to allow normal brake booster operation. (4) Operate the brakes to perform the test. (1) Enter inspection mode to disable TR(A)C and VSC control. 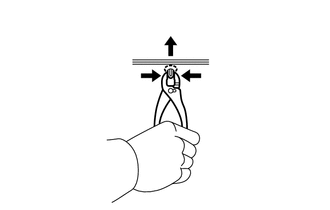 (2) Follow the instructions shown in the illustration. Confirm that the vehicle is securely immobilized. Follow all usage and safety procedures in the operator's manual for the chassis dynamometer. Be sure to follow the instructions specified in the illustration. Failure to do so may cause deterioration of AWD system function, malfunction of drivetrain components and risk of the vehicle jumping off of the dynamometer. (1) Raise the vehicle until all 4 wheels are off the ground. (2) Support the vehicle with safety stands at an appropriate height. Make sure that vehicle does not lean in any direction, and that the tires are completely clear of the floor. (3) Place the vibration pick-up unit into position for the wheel to be measured*1. (4) Release the parking brake. (5) Check that no dragging force exists when turning each wheel by hand. (6) Put the wheel balancer in position. (7) Wheel balance measurement should be done by using both the engine and the wheel balancer drive roller to spin the wheels. *1: Different on-vehicle wheel balancers have different requirements for mounting the vibration pick-up unit(s). 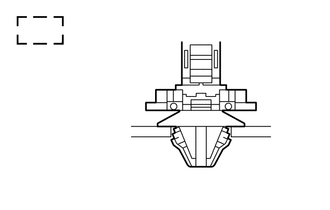 Refer to the operator's manual for the wheel balancer to confirm requirements for use. Start the engine and then increase the vehicle speed gradually with the shift lever in D.
Do not accelerate or decelerate suddenly. Deceleration should be done by braking gradually. Make sure that no one is standing in-line with the spinning wheels. Measurement should be done quickly. 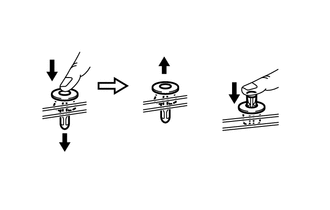 Follow all usage and safety procedures in the operator's manual for the wheel balancer. 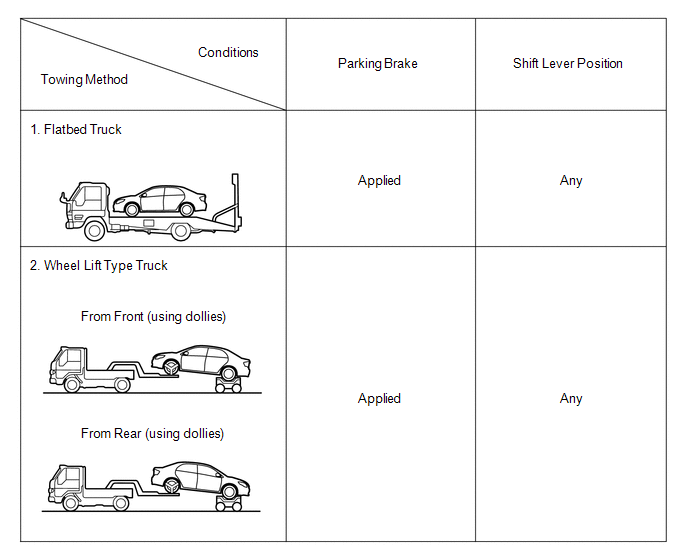 (a) Use one of the following methods to tow the vehicle. (b) If the vehicle has trouble with the chassis or drivetrain, use method 1 (flat bed truck). Do not use any towing method other than those shown above. (c) If a tow truck is not available, in an emergency the vehicle may be temporarily towed using a cable or chain secured to the emergency towing eyelet(s). This should only be attempted on hard surfaced roads for distances of less than 80 km, and at speeds below 30 km/h (19 mph). A driver must be in the vehicle to steer and operate the brakes. The vehicle's wheels, drivetrain, axles, steering and brakes must be in good condition. If the towing speed or distance exceeds the above limits, or the vehicle is towed in a backward direction with any of the wheels on the ground, the drivetrain may be damaged. Depress the brake pedal and move the shift lever to N.
Use extreme caution when towing the vehicle. Avoid sudden starts or erratic driving maneuvers which place excessive stress on the emergency towing eyelet and the cables or chains. Do not turn off the ignition switch. Turning off the ignition switch may result in engagement of the steering lock, resulting in a hazardous situation or accident. (d) The towing methods shown below are dangerous and can damage the vehicle, so do not use them. (1) Do not tow the vehicle with only two wheels on the ground. If the vehicle is towed with only 2 wheels on the ground, the drivetrain may overheat and be damaged, or the wheels may come off the dollies. 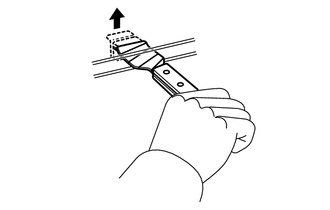 (2) Do not use a sling-type towing method either from the front or rear. 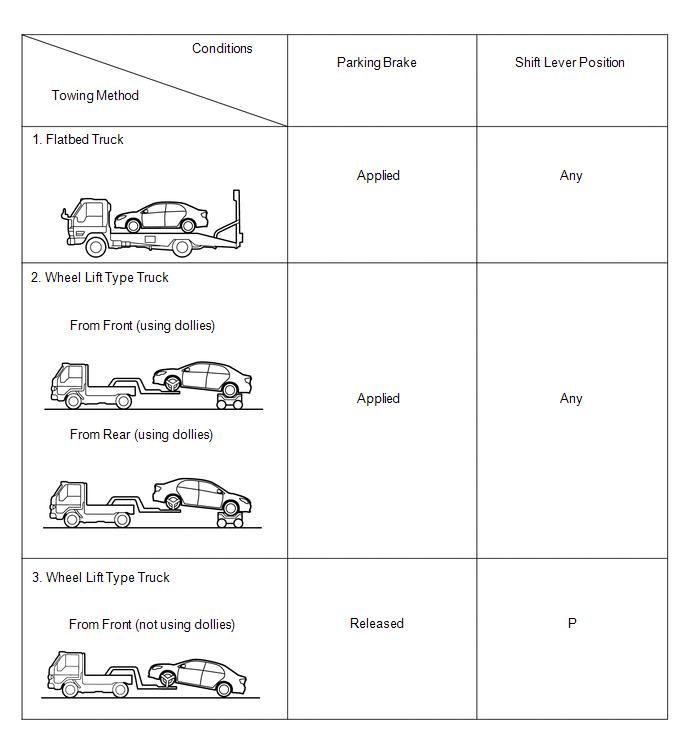 If a sling-type tow truck is used, damage may occur to the vehicle body. (b) If the vehicle has trouble with the chassis or drivetrain, use method 1 (flatbed truck). (c) If a tow truck is not available, in an emergency the vehicle may be temporarily towed using a cable or chain secured to the emergency towing eyelet(s). This should only be attempted on hard surfaced roads for distances of less than 80 km, and at speeds below 30 km/h (19 mph). A driver must be in the vehicle to steer and operate the brakes. The vehicle's wheels, drivetrain, axles, steering and brakes must be in good condition. If the towing speed or distance exceeds the above limits, or the vehicle is towed in a backward direction with the front wheels on the ground, the transaxle may be damaged. (1) Do not tow the vehicle facing rearward with the front wheels on the ground. If the vehicle is towed facing rearward with the front wheels on the ground, the drivetrain may overheat and be damaged. In addition, if the vehicle is equipped with the VSC system, the system may apply the brakes to the rotating wheels. (a) Use only unleaded gasoline. 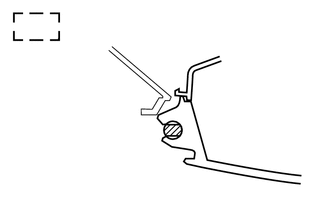 (b) Avoid idling the engine for more than 20 minutes. (c) Avoid performing unnecessary spark tests. (1) Perform a spark test only when absolutely necessary. Perform this test as rapidly as possible. (2) While testing, never race the engine unless instructed. (d) Avoid a prolonged engine compression measurement. Engine compression measurements must be performed as rapidly as possible. 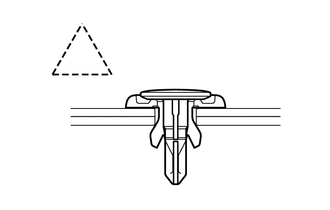 (e) Do not run the engine when the fuel tank is nearly empty. This may cause the engine to misfire and create an extra load on the converter. 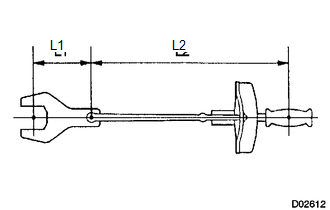 (a) When performing operations which involve the removal and installation of the propeller shaft, always check the joint angle. Make adjustments if necessary (See page ). (a) The type of ignition switch used on this model differs according to the specifications of the vehicle.